Which is worse, the soap, the soap scum or the scum who sells this soap as safe when it is not? Since March 3, 20o3 (in an article entitled “Health Scam”) (1), I have been warning about antibacterial soap. There is a health danger contained in this soap and in the past decade and three years I have reiterated the warning. 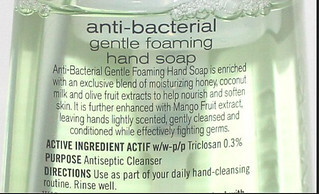 Image from healthyhomecleaning.com “Dangers of triclosan antibacterial-soap” (2). A Wall Street Journal article entitled “Are Antibacterial Soaps Safe?” (3) shows that my warnings have been spot on. Finally the FDA looks as if they might protect Americans from this fact, but they probably won’t. See why below. The Food and Drug Administration will make a decision this year on whether antibacterial soaps that contain the chemical triclosan are safe and more effective than plain soap and water. Studies about triclosan, shows that it can interfere with hormones and cause changes in thyroid, reproductive-growth and developmental systems. There is also evidence that widespread use of antibacterials helps create drug resistant super bacteria. We cannot escape the problem by simply avoiding this type of soap either. The chemical is washed down the drain and remains in the environment. Triclosans environmental afterlife can last for decades. A publication in the journal, Environmental Science & Technology, says that U.S. streams have a 60% to 100% likelihood of containing detectable quantities of the triclosan and other chemicals from antibacterial soap. High levels of these chemicals are found in municipal sludge and drinking water as well as in urine and breast milk. However this chemical may still be allowed in soaps. Why? The market for soap, bath and shower products is 5.5 billion a year and 140 companies that make soap formed “The American Cleaning Institute” to represent them. This marketing, lobbying group takes the position that the FDA has “neglected a substantial amount of existing safety data”. They argue that triclosan has been used safely for decades and dispute that it is helping create super resistant bacteria. The marketing and lobby groups for soap manufacturers say that that banning antibacterial products would increase exposure to bacteria and increase infection and disease, including 7.5 million cases of food-borne illness and $38 billion a year of extra health costs. The American Cleaning Institute even tried to stop a study, created by the FDA’s suggestion, of whether there is risk to cancer from skin exposure to triclosan. History suggests that when big business has enough money at stake, the cash flows through the political system and gums up the institutions that are purportedly designed to protect our health. Beware of the scum in this scam because not all of it is created by soap. Fortunately in our modern world, we have access to information from healers in all places and from many times past and present. Look beyond the advertisements of big business and don’t rely on Big Brother to protect your natural health. See below to protect against such scams. It’s hard to avoid toxicity from household dust. 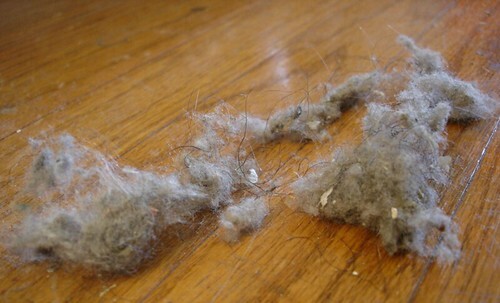 Household dust is toxic. Americans spend over 90 percent of their time in buildings or cars where levels of pollution are concentrated. According to a study of 1,200 US homes, household dust contains an average of more than 5,000 types of bacteria and 2,000 kinds species of fungi. Yet the soaps and shampoos we use to clean may be even more toxic than the dust. Here is an excerpt from the second report in our shamanic health series that we are about to release. This report shows how to avoid toxicity and purify. “Merri’s and my long time friend, Jay Glaser M.D. is an M.D. and ayurvedic physician. 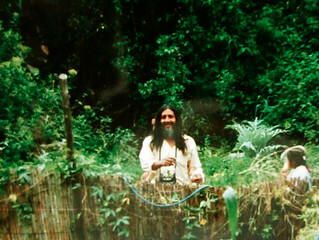 He spent many years studying in India and traveled with Merri and me to Ecuador to learn about Andean healing. Even soaps and shampoos that are branded as natural, organic and healthy must be looked with a critical eye. Take for example, Jason shampoo, the shampoo I used in the past. Jason advertises that it has offered natural care since 1959 and is a trusted, smart choice for families with a complete range of safe, effective products infused with botanicals, plants, roots, herbs, proteins, vitamins and minerals. Yet as I studied the Jason brand more I saw that the company’s history makes one suspect: the word “trusted”. Jason is owned by the mega company Hains Celestial Group and there have been numerous federal and consumer lawsuits against mislabeling and adulteration of products. Just a couple of many examples include a 2010 citation by the U.S. Food and Drug Administration for numerous violations of good manufacturing practice in manufacturing, packaging, labeling for dietary supplements. In 2013 a California consumer lodged a revised suit in federal accusing Hain Celestial Group Inc. for misleading consumers. Another federal class action claimed that Hain Celestial Group misrepresents its Jason and Avalon Organics brand “personal care products” as organic when they actually contain less than the required 70% organic ingredients. The company admitted that only the Aloe Vera leaf gel was organic and it was only the ninth of 19 ingredients. I had used the Jason Super Shine Shampoo Apricot Oil shampoo, so took a look at the label. No more Jason for me! An examination of some of the ingredients shows that even if the label is reliable the healthiness of this product must be suspect. Here are just a few of the ingredients that make me shudder. Dimethicone is one example of a potential risk. The Canada Domestic Substance List recommends restricting it in cosmetics. Dimethicone is suspected of organ system toxicity and is classified as toxic or harmful to the environment. Phenoxyethanol is a questionable chemical. This is a glycol ether and its MSDS says that phenoxyethanol is harmful if swallowed, inhaled or absorbed through the skin and that it can cause reproductive damage. Ethylhexylglycerin is classified as an irritant in the European Union. Tocopheryl Acetate. There is strong evidence that Tocopheryl Acetateis can be a human skin toxicant or allergen according to Cosmetic Ingredient Review Assessments. One or more animal studies show tumor formation at high doses. Guar Hydroxypropyltrimonium Chloride. There is strong evidence that it is a human skin toxicant or allergen according to Cosmetic Ingredient Review Assessments. One or more animal studies show tumor formation at high doses. Benzyl Salicylate. The MSDS says this chemical may cause an allergic skin reaction, cause serious eye irritation may cause damage to organs and is toxic to aquatic life. Each of these chemicals in the Super Shine Shampoo Apricot Oil shampoo are questionable. The more serious question I asked is is “What does a daily dose of this combination of chemicals soaking into the skin on my head do?” I doubt (nor could I find) that there are any studies on this combined risk. I discussed this problem with our long time friend, Candace Newman, The Oil Lady. She formulated a wonderful, truly organic liquid face and body soap for Merri and me to use. 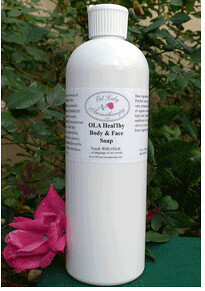 Here are the ingredients of her OLA HealThy Body & Face Soap. The base ingredients: Purified water, organic aloe vera, potassium soaps of organic coconut oil, high-oleic organic sunflower oil, organic olive oil, oleic acid from organic palm oil. Not Bad and a Lot of Good! All the ingredients in the base oil are organic, plus there are 7 essential oils specifically well-known for exceptionally good and regenerative skin care… since time immemorial. The synergistic formula of these essential oils is exquisite and safe for the skin. This soap eliminates the bad in a cleansing ingredient and replaces it with a lot of good. Candace’s soap cleanses and encourages better health! Here are the seven essential oils. Lavender (Lavandula augustifolia) – excellent for all skin types, anti-inflammatory, antimicrobial. True Lavender is the #1 balancer for the central nervous system for physical and emotional distress. Geranium (Pelargonium roseum) – anti-Inflammatory, antiseptic, astringent, tonic, soothing. Recognized as The Nurturing Oil for skin, hormones, and emotions. Soothes the nerves and dryness of life. Ravintsara (Cinnamomum camphora) – antibacterial, antiviral, anti-inflammatory. The Gentle Giant of protection for our immune system and skin issues. Tea Tree (Melaleuca alternifolia) – known for its broad spectrum of antimicrobial activity against bacteria, viruses, fungi. The #1 First Aid Oil for skin infections and tissue issues. Orange (Citrus sinensis) – antibacterial, antiseptic, anti-fungal, anti-inflammatory tonic. The Natural Tranquilizer with its sweet nurturing aroma offers cleansing and calming properties to our state of well-being. Frankincense (Boswellia carteri) – antiseptic, astringent, anti-inflammatory, tonic. The Great Protector and Oil of Strength for warding off the challenges of life. Exceptionally healthy skin care and excellent with maturing or troubled skin. Rose Otto (Rosa damascena) – antiseptic, astringent, emollient, softening, hydrating. Ideal for all skin care. The Oil of the Heart, Queen of the Heavens … rose is the aromatic comforter for our skin and emotional state. This gentle oil is a powerful nurturer for the heart and soul. Known to regulate and harmonize our systems while increasing our sense of well-being. Candace’s Face and Body Soap solved my soap and underarm concerns and more, because one day I was out of shampoo and used it to clean my hair. Not only did the Face and Body Soap clean well, it left my hair feeling softer and with more body than the other shapoos. The combination of oils made the body and face soap a better shampoo than I had ever used before. Now Candace’s Face and Soap oil is Merri’s and my shampoo of choice! It solves the problem of what kind of soap to put on our heads. Pollution is everywhere, inside and out. Fortunately our bodies are quite adept at protecting us from much of the toxicity. When we combine our body’s natural defenses with ancient wisdom on purification we can take a big step forward in natural health. More than 100 studies have found that physical activity can lower cancer risk and even help cure cancer. Fortunately researchers asked why and one answer became clear. Body fat. Studies showed that those who were most active have a 25% lower chance of developing cancer because reduced body fat is possible pathway to lowering cancer risk. Time Magazine has some good information on the relationship between exercise and reducing cancer. Have a look below if you want to research more deeply (1). Graph showing benefits of intermittent fasting. Fortunately there is a little known way to reduce body fat that does not even require exercise. I’ll share more on this secret in a moment. First, body fat and cancer? Let’s ask why? Part of the answer is toxicity. Healthy bodies naturally and regularly remove water-soluble toxins from the body. Our blood and kidneys flush them away. Fat-soluble toxins such as metals, pesticides, preservatives, other pollutants are harder to flush out of the system. Fat-soluble toxins must become water-soluble before the body can get rid of them. The liver can do this conversion (bile emulsifies fat-souble toxins into water-soluble). This process requires healthy digestive and detox pathways. When they become imbalanced, fat-soluble toxins are stored in fat cells and brain cells instead. These toxins can remain for decades and create health problems. The fat stored toxins cause oxidation (free radical damage) and degeneration as well as mutation. Toxins in the fatty tissue of the brain become neurotoxins that can cause cognitive problems and a host of mental and brain imbalances. The way to avoid this storage of deadly toxicity is to keep stress down, while digestion and detoxification pathways remain good. When you burn fat not primarily for weight loss, (though you will lose weight) but for purification, you can turn on the body’s detox fuel. Fat metabolism is the body’s natural form of energy. Fat metabolism provides a more steady energy than glucose metabolism and flushes fat cells free of toxins. As the toxicity drops, the nervous system has reduced stress and will naturally burn fat instead of sugar. Intermittent fasting is one way to get the body to burn fat. There is a way of eating that helps reduce weight, improve energy and purify the body as it returns to a state of natural health. This is a simple easy way to improve and restore feeling good, but works best when combined with better nutrition, moderate exercise and a purification program that helps make sure that the body is not overwhelmed with too much purification at once. This is why I have written a short report entitled “The FAST Way to Better Health” that features one special tea so an intermittent fasting routine becomes doable and enjoyable. Intermittent fasting is guaranteed to work, if you have even reasonable nutrition, moderate physical activity and stick with it. The problem is in the sticking. When the brain is hooked on metabolizing sugar it can be very demanding. When we try going an extended period without a sugar, the brain will have a hissy fit and demand that we eat or drink something sweet or starchy or alcoholic. Sticking through a fast just does not work when the brain pulls out its bag of tricks, from sweet whispers (just one chocolate won’t hurt- but it will!) all the way to chills sweats and dizziness. Intermittent fasting, without help, can require enormous discipline that most of us cannot maintain long enough. I know, I tried intermittent fasting several times and failed. Then I accidentally stumbled across the secret of the Hogberry that not only stops hunger but more importantly speeds up the process of switching from sugar metabolism to fat metabolism AND assists in the purifying process. Once I tried using this support for the pancreas (among other things), intermittent fasting became satisfying and enjoyable. I am passing 45 days in this routine, and the steady energy just gets better and better. I am not minding the reduced weight and better fitting clothing either! “The FAST Way to Better Health” explains how intermittent fasting is not real fasting. One does not stop eating with an intermittent fast, not even for a day. You learn why this is such a healthy way to lose weight and detoxify fat cells to reduce risks of cancer, heart disease diabetes and senility. More important you learn how to feel better almost from the very first day. Reduce stress, gain smooth steady energy without 10:30am and 3:00pm droops. Find out how to avoid being hungry right after you eat and how to make the cravings for sweets and junk food all but disappear. I will send you this report “The FAST Way to Better Health” that reveals the secret of the Hogberry, FREE when you order my Shamanic Natural Health reports described below. This is the only way to attain this report. Intermittent fasting can make your life better. It works best when you use the nutritional, exercise and purification tips outlined in these three reports. As with all my reports and courses, satisfaction is guaranteed or your money back. I want to be sure that the information in “The FAST Way to Better Health” works for you. The valuable knowledge you’ll gain in these reports works better when the nutrition, purification and exercise reports are combined so I have made a special offer. In this special offer I want to send you a special report on how you can gain better natural health with the hogberry along with three other reports that reveal secrets of health and longevity. Few places can destroy health and ruin a lifetime of savings faster than a hospital. We are at risk from pocketbook surgery and the incredibly dangerous “Chargemaster”. See below why chargemasters were normally kept secret, how a 2018 federal law requires their disclosure and how to gain protection from their abuse. How can it be that medical costs are so high? Why is it so difficult to figure out the charge for a medical procedure? The government in trying to help answer these questions began requiring hospitals from Jan. 1, 2019 to post their chargemaster lists. These enormous lists of products and services ranging from a single aspirin up to a complicated surgery does little to answer these questions. This very weak attempt to create transparency only provides data that is difficult to decipher and is mind-boggling for the consumer. Chargemasters can include tens of thousands of items and procedures, with technical names and abbreviations that few can understand. Plus when one goes into the hospital no one knows exactly what items and procedures will be necessary since treatment can vary widely based on the age and health and condition. So listing the chargemaster isn’t helpful or meaningful, but simply gives hospitals one more excuse for outrageous costs… “but we listed what these costs”. Plus it was recently revealed that medical endoscopy scopes in hospitals were infecting patients with deadly drug-resistant bacteria. The facts about this had not been previously disclosed. The Centers for Disease Control and Prevention (CDC) estimate that hospital-acquired infections alone kill 99,000 people each year. Here is an even worse hospital mortality fact. 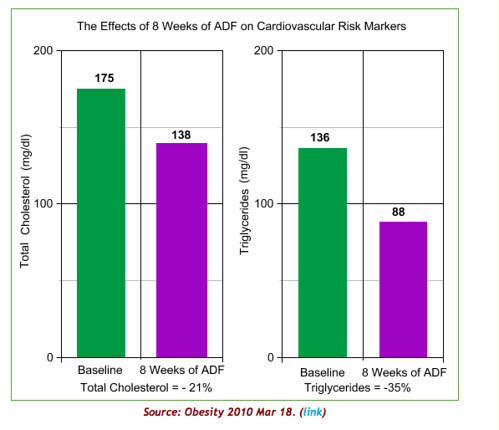 The image above shows a report from the Centers for Disease Control & Prevention. 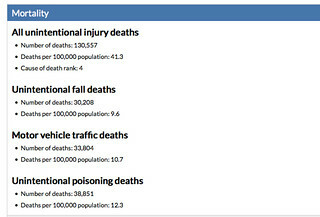 Hospital-acquired infections alone kill 57% more Americans every year than all car accidents and falls put together. Often, what patients catch in the hospital is worse than what sent them there. Governments and health care agencies agree – antibiotic resistance is a “nightmare.” An antibiotic-resistant bacteria may be spreading in more hospitals than patients know. About one in every 25 hospitalized patients gets an infection and a 2013 report from the Journal of Patient Safety showed that medical errors are the third-leading cause of death in the country. Along with the risk of hospital acquired illness and medical errors, the second huge threat to our well being… is health care costs, especially at hospitals. This is because of the secrets in the chargemaster and the people who do not want us to know how much hospital costs have risen . Motivations beyond our good health, like corporate greed, want to keep us in the dark about health care cost. 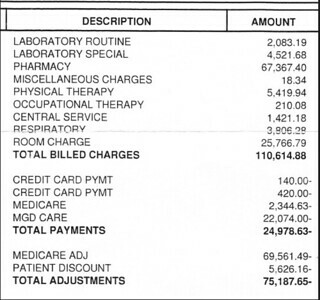 The hospital bill above is part of a story about a $110,000 infection and why hospital “chargemasters” are often secret. This story tells how one person with resistant devastating infection ran up a $110,000 hospital bill only to find that Medicare would only pay $2,300 from treatment of infection. Being in a hospital can kill as well as cure. There are odds on that. What is more certain is that hospitals can kill our finances. The ‘average’ cost of hospital care is rising because the leading hospitals are front runners in figuring out how to amass market power so they can raise prices and decrease competition. A codeine pill that costs $20 at a hospital costs 50 cents at Rite-Aid or Walgreens. Hospitals have “chargemasters” a price list created by each hospital, that typically has more than ten thousand entries, so almost nothing — even an aspirin, a bag of IV fluid, or a visit from a physical therapist to help a patient get out of bed — is free. However, those lists are usually secret. The Commonwealth Fund in its latest survey on overall health care ranked US healthcare dead last compared to 10 major countries. Despite being worst, USA Today, Wall Street Journal, Forbes, New York Times have all warned about huge, increasingly costly, health care changes. There are enormous problems in hospitals and chances are they are going to get worse. When it comes to health care, we may well be on our own. The very people, institutions and establishments that we should rely on may actually hurt rather than help our health. Shamanic Wisdom accumulated over the millennia can fill the gap. The way to escape the dangers of the high cost deteriorating health care system, is to not need it. Declare health independence… and create natural good health. There are dozens of simple, really low costs steps that can improve health… eating, purification, exercise, even the way we think and don’t think when we sleep. Ancient shamanic wisdom from around the world can help us reduce our risks of poor health care and help us fight the ever rising costs. For nearly 50 years my wife Merri and I have lived around the world and checked out just about every source on natural health care. We have spent years living with natural health care insiders, and trying what they offered. Since not everyone can go to Ecuador or travel the world, we have created three Shamanic Natural Health Care Reports that can help improve our natural health. They are concise and to the point. In 15 minutes the first report shows exactly how to start preparing for better health and more energy. We do not have to depend on the health care and health insurance monopolies for better natural health… or cave into a healthcare system that can put us at risk and charge outrageous prices at the same time. Our shamanic health reports provide information on how to use ancient health care systems to become more healthy – self sufficient – providing our own good health. The first report is “Sunski”, the Andean word for good eating, for maximum nutrition and purification. These are typical notes I have received from readers. * “The food was so delicious and I thought I ate a lot, but during the week I lost six pounds!” WB Australia. Good eating is the first step towards natural health. The first rule of good health is getting the correct nutrition. The second step is purification of toxins and eating to avoid getting impurities in our body in the first place! Sunski is a way to eat that strengthens and purifies as it stops adding toxicity from eating. Yet Sunski is a delicious, healthy “self defined” cleansing process. One lesson in Sunski shows how to correct a simple mistake that most of the Western population makes which increases the chances of adding and retaining weight by 84%. “Sunski” combines lessons about healthy eating that we learned from years of working with ayurvedic health masters and then living with an Ecuador Taita Yatchak and his apprentices. We lived, worked, farmed, cooked and ate with this Taita Yatchak for years while learning “Sunski”. The “Sunski” report has been 50 years and millions of miles of travel in the making. We’ve invested thousands of hours into learning the skills of health self-reliance and resilience, identifying the best foods and combinations and sifted through loads of seeming contradictions to get to the facts about “do it yourself” longevity and natural health. But that wasn’t enough – not when our good health is on the line. So we consulted dozens of top professions who know a lot about natural health. We spoke with holistic MDs chiropractors, Indian Vidyas, Andean Yatchaks, and other self-reliant natural health experts who live this way every day. Don’t let the simplicity fool you… years of research went into these reports. And we only kept the best of the best: this system is complete – and FAST to learn – so you can get started immediately. We all need to stay out of hospitals and reduce our exposure to modern medical risks and costs. Why re-invent the wheel? Especially when time is NOT on our side. We’ve already done the hard work for you pulling together the information so you can create better natural, good health. Imagine… never worrying about what we eat ever again and reducing the risks of hospitalization and health care’s outrageous costs. #1: Eat a balance of fat, carbohydrates and protein. #2: Eat combinations of food for ideal digestion. #3: Eat clean organic food prepared and served by happy, joyful people. #4: Eat in good spirits at the right times of day. #5: Chew in the correct way. #6: Eat purifying and satisfying meals. #7: Adapt eating habits that are suited to individual specific makeup and lifestyle and why such individualized nutrition is better than any specific set plan. This report includes a complete list of EZ to use recipes that will immediately improve your short term energy… and your long term natural health – so that you never have to guess what foods you need (or rely on the health care establishment to tell you the truth). * The single biggest constraint you’ll face in your eating habits – and how you can eliminate it by adding two simple recipes to your Sunski system. * How to calculate exactly how much food you need so you don’t over or under build your nutritional plan. * A simple solution for making sure that your food delivers what your body needs when you need it. * What components you can choose for yourself and how to avoid mass diets that seem to work for every one except… you. * The best long term solution for avoiding sugar. * Use sweet spices to compensate for stress. * Specific types of unique spices that give you the biggest energy bang for your buck. * Spices that cleanse and purify. * Three changes in your fruit consumption that is a critical component for long term purificatioN. * The best times to eat specific foods. * How to direct different foods to different parts of the body. * Three teas that add a resilience to your natural health system that are easy to make and enjoy at home at a low cost. * Why it is good (in fact almost a requirement) to sometimes eat junk food. This report on nutrition also includes 23 special recipes of quick and easy but perfectly balanced meals and snacks. 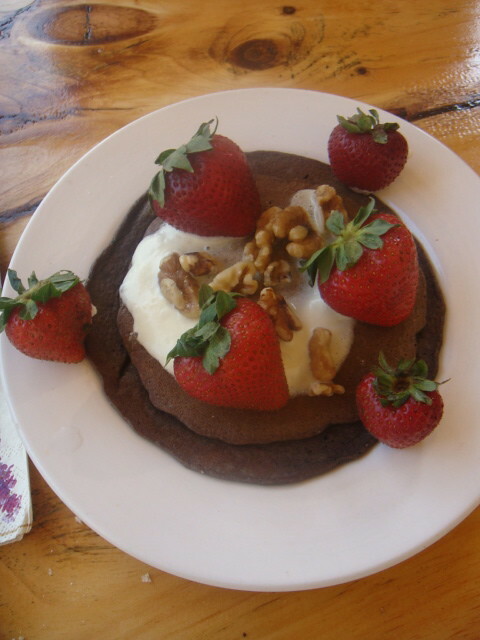 One of the recipes is for high protein Chocolate Quinoa Pancakes. All of this information is in “Sunski” the first of the three shamanic health reports. Special and delicious, but fast and healthy recipes. These recipes are easy to make, delicious to eat, inexpensive but balanced and healthy foods prepared in a shamanic way. All of these recipes are in “Sunski” just one of the three shamanic health reports. Learn how nutritional secrets can help keep you out of the hospital. These reports focus on how to have good natural health so you can remain independent and avoid costly medical care. The second report looks at purification and detoxification. The third report is about exercise… but not the type you would think. For example this third report unveils one exercise that is a nutritional trick that has nothing to do with what we eat. The trick is to energize and coordinate the digestive system by exercising a set of key muscles as we eat. The body has a number of key muscles that regulate breathing, digestion, circulation, elimination and muscular motion. The report reveals an exercise you can do at the dinner table to energize these muscles which in turn coordinate every other muscle and organ in the body. Eating in this way for example (most of the modern world does not) energizes just one key muscle that regulates part of our ability to burn sugars and fat. Part of the report focuses on how to have financial balance in investing and business so you can remain independent. The report looks at oxygenation, coordination, purification, energy boosting, education, occupation and relaxation. Oxygenation-Coordination: Learn how to gain extra oxygen with the Llama Walk. Purification: We look at Andean purification herbs and purifying teas. Energy Boosting: Eating balanced, correctly prepared organic food and drinking herbal teas designed for body type and body imbalances. Occupation: Physical labor, suited to your body type and condition range from gardening and animal care to path building and clearing the woods. Relaxation: Learn how Meditation, L-Thianine and Baroque Music enhance thinking and relieve stress. Body Types Made EZ: Learn how they cause and influence nine body types and their imbalances. Discover seven easy ways to determine your body type and how to keep it in balance. Healthy Eating Made EZ: Gain delicious, power packed weight reducing recipes from easy to obtain products from super market foods. Coddle Yourself Egg-High Protein Country Cottage Pie-Low Carb-Veggie Chile & Spaghetti- Weightless Bread-High Mountain Pure Protein Quinoa-Better Oatmeal of Steel- Several Soups for Super Strength-Berry Good Crunch Treat and Waist Less Apple Crumble are just a few. Exercise for Strength and Better Health Made EZ: Medicine is dose. Too much exercise is as bad or worse as not enough. Learn how to let comfort be your exercise guide. Move with momentum-some exercises activate all muscles and provide the benefit of leverage, momentum and convenience so 12 minutes of exercise a day is enough. Blend body and mind-Alpha exercises take you into the zone so you win from the inside out. Spin and bend-blend exercise secrets from India, the Andes and the East for easy and better health. The Gentle Touch-if you have to breathe through the mouth you have done too much. Good health is the most important asset in stressful times. Beyond the fact that modern health intervention (ie. hospital) can destroy one’s finances, being in good health brings the energy and balance required to make sound investing and business decisions. There are many ways to improve health naturally. 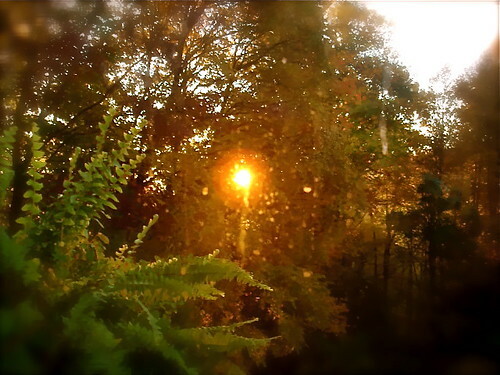 Watching the sun rise promotes good natural health for example. Our use of color and observing the correct colors (frequencies) at the correct time are important. We have been incorporating the ideas of how natural health promotes everlasting wealth into our courses and seminars for decades and this report covers them all. Here are 11 main points covered in the reports. #1: Quantum mechanics, frequency, health & wealth. How they all connect. #2: Three aspects of being – air – fire – water… how to balance and integrate them. How a moonlight stroll reduces the risks of excessive adrenaline. #3: Three ways to integrate brain waves and be in the zone… 60 cycle sound… L- theanine and meditation. #4: The Andean – Indian Connection. How Ayurved and Andean relate. Three fundamentals of longevity. Eat right, work well and sleep soundly. #5: How dis-ease develops and is stopped with nutrition, exercise and purpose. #6: How to use cleansings. Melon, pineapple, apples-grapes, vareshna, chelating, cinnamon-sweet pepper tea, steam and mists. Teas: How and when to use cedron, chamomile, lemon verbena, peppermint. #7: Ways to relax. How to use chamomile, valerian, lettuce and milk, hot water, vata press. Ways to calm down. How to use peppermint tea, aloe, cream massage, frozen grapes. Ways to wake up. How to use cinnamon tea, paprika, cloves, ginger, ginger-black salt and lemon juice. #8: How to use, colors and sound to stimulate organs and glands. #9: EZ Shamanic exercises-yoga, llama walk, lizard, sun salute, crab and mouth release, ring chew, etc. #10: How to use the senses, taste, six flavors. #11: How to use essential oils to balance wellness. Here is a special offer available for subscribers to Truth & Plenty. When you order the three shamanic health reports that normally sell for $19.95 each, you save $19.95 plus get a report on the hogberry free. More important you learn how to feel better almost from the very first day. Reduce stress, gain smooth steady energy without 10:30 am and 3:00 pm droops. Find out how to avoid being hungry right after you eat and how to make the cravings for sweets and junk food all but disappear. This is the only way to attain this report as it is not for sale or available to the general public. Intermittent fasting can make your life better. It works best when you use the nutritional, exercise and purification tips outlined in these three reports. As with all my reports and courses, satisfaction is guaranteed or your money back. I want to be sure that the information in “The FAST Way to Better Health” works for you. The valuable knowledge you’ll gain in these reports works better when the nutrition, purification and exercise reports are combined so I have made this special offer. Order all three Shamanic Natural Health Reports worth $59.85 for $39.90 and save $19.95. Order all three Shamanic Natural Health Reports worth $59.85 for $39.90 and save $19.95. Plus you receive the report “The Fast Way to Better Health” and our 60 day, full satisfaction or full, no questions asked, refund.